Every organization has legal policies, or waivers, that your customers must agree to. You should consult with your attorney to draft the legal policies that pertain to your organization. The sample texts that come with your database are simply examples and are not legally binding. You can only have one set of Agreements (Legal Policies) for Classes. If you have different Legal policies for example, for Summer Camp, you will need to change the Agreement Texts before Summer Registration begins, then change the Agreement Texts back to your school year policies before Fall Registration begins. Your legal policies will be displayed as READ ONLY and adherence/agreement is mandatory to submit the registration form. The customer can not edit the text nor fill in blanks. They must agree to every textbox. Therefore, do not attempt to ask questions or give "fill-in-the-blanks" options in your policies text. Add your various Legal Policies for Classes and Save Changes. 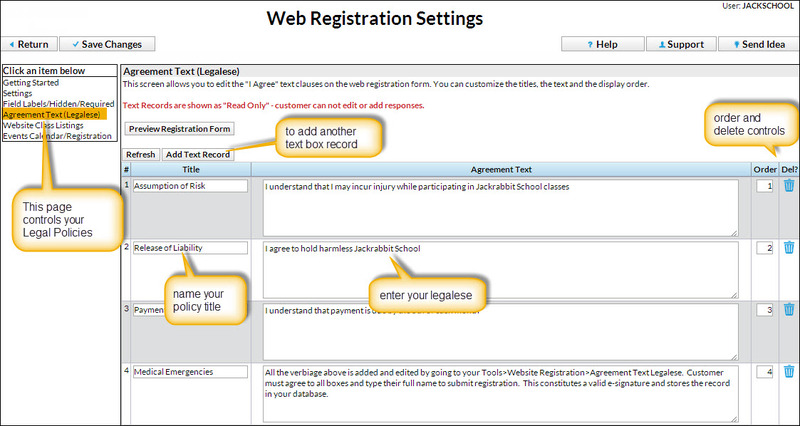 Jackrabbit's Online Registration Form requires a Full Name to be entered by the person agreeing to your Legal Policies (legalese). Our software abides by the Electronic Signatures Act signed in 2000 which considers online submissions binding. Read more about the ESIGN Act in Wikipedia. We recommend that you confirm procedures with your insurance agent and attorney. The email notification with time and date stamp falls under the criteria of this Electronic Signatures Act and allows you to consider Online Registrations binding. You also have the ability to view and print the date stamp with full signature for each registration. On the Family Misc tab, hit the "View Registrations" button and select the initial Web Reg or the most recent Portal Agreement and click "View". The pop-up page will contain the full signature entered as well as the Agreement texts that were in effect on the date they agreed. To learn about updating your Policies and forcing your existing customers to "re-agree", and to see how to determine the most recent Agreement date, etc, reference the Legal Policies and the Parent Portal page.